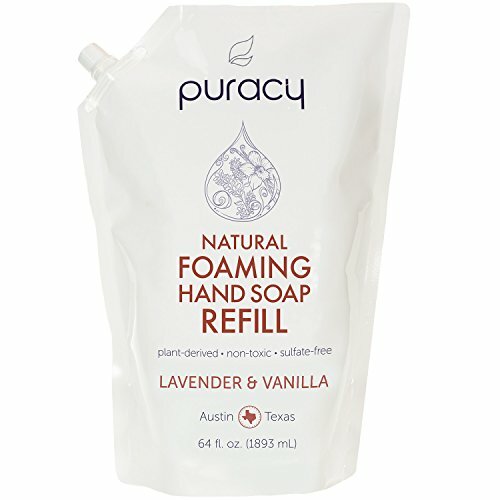 Puracy Natural Foaming Hand Soap (WATERY liquid for foaming dispensers, ONLY) is a non-toxic, effective, and versatile skin cleanser made from plants, minerals, water, lavender essential oil, and vanilla absolute. The biodegradable ingredients were carefully chosen and developed into a premium solution by Puracy, a trusted source for natural, plant-based, child & pet safe, hypoallergenic, and effective household products. The proprietary blend of renewable ingredients is family friendly and free from harsh chemicals and fumes. This unique formula leaves no residues or lingering scent. Our hand soap is tough enough for grease, gentle enough for children, and pure enough to naturally recycle in the environment. This product is 99.95% Natural, per Puracy's 'What Natural Means to Us' definition available on our website. We're passionate about our mission, and so are the people whose lives have been positively impacted by it. We regularly donate our natural and organic products to local organizations in need, such as Austin Children's Services, to help support their cause. For Pumps that Dispense Foam, ONLY (this is a watery liquid; see our Natural Liquid Hand Soap listing for thick liquid gel hand wash); NEXT GENERATION FORMULA: More Concentrated = More Luxurious Foam & More Moisturizers; Clean 5,000 hands per refill pouch! If you have any questions about this product by Puracy, contact us by completing and submitting the form below. If you are looking for a specif part number, please include it with your message.